Part of our multi-award winning portfolio…. 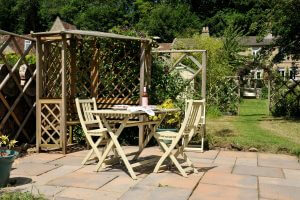 Family owned rural luxury cottage escape in an Area of Outstanding Natural Beauty just minutes from Bath. 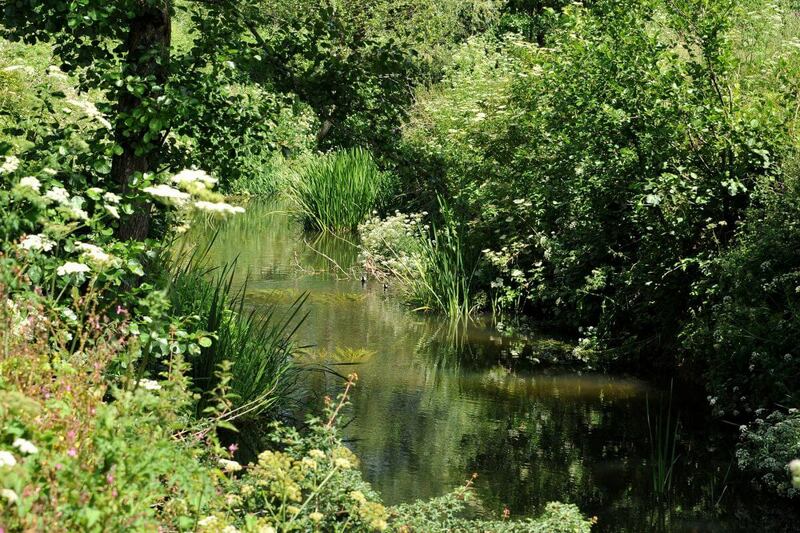 Fishermen’s Retreat overlooks the glorious Midford Valley and is the perfect tranquil haunt for birdwatchers, fly fishers, cyclists and walkers. Enjoy 10% off when you book direct. This 4 Star Gold luxury self-catering cottage is the perfect haunt for birdwatchers, fly fishers, cyclists and walkers as well as culture vultures. 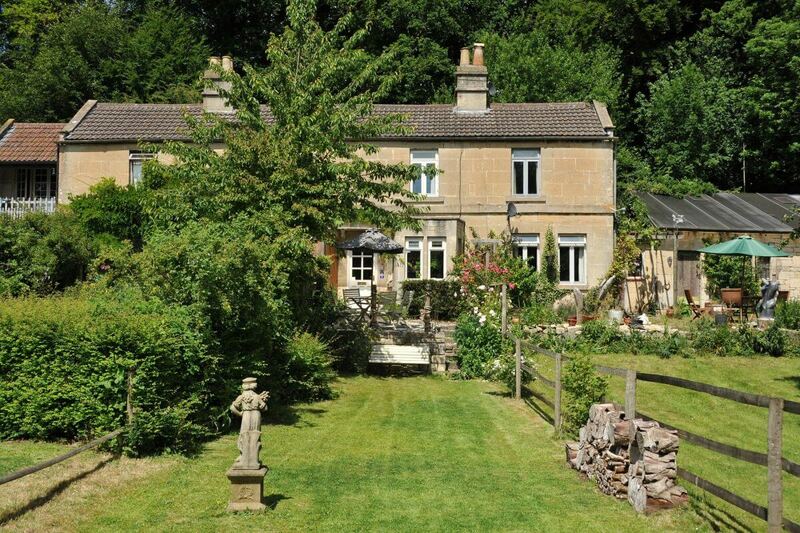 Just under 15 minutes from Bath city centre Fishermen’s Retreat is tucked in to the hillside of the glorious Midford Valley, an Area of Outstanding Natural Beauty. 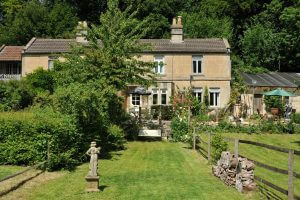 As a result, this 18th century artisan hideaway is the ideal place to relax and unwind from the bustle of Bath. 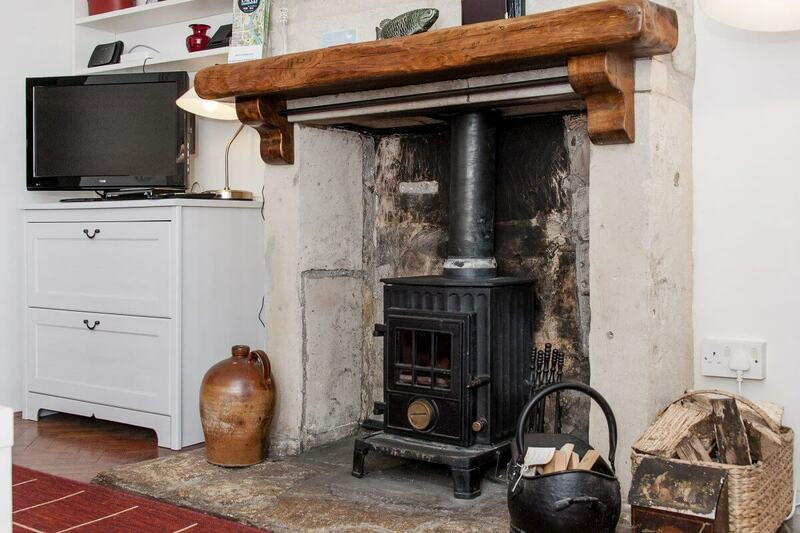 It is newly renovated with style and comfort in mind, but retaining original features such as wooden floors and the traditional fire place with a log burning stove. Fishermen’s Retreat sleeps two guests in the master bedroom. The spacious south-facing room has a generous king size bed, wrapped in Egyptian cotton linen, and stunning views out across the Midford Valley. There is room for a third overnight guest in the small single bedroom and there is also a sofa bed in the sitting room, should you need it. Upstairs is the bathroom with a walk-in shower, heated towel rails and fresh cotton towels. 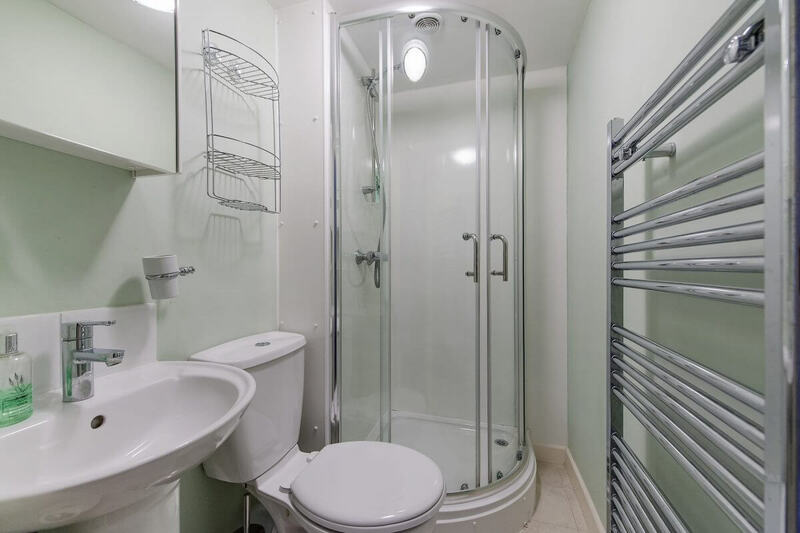 Downstairs is a spacious kitchen with all the modern amenities for your self-catering needs. The kitchen leads through an open arch to the spacious sitting and dining room with contemporary fireplace, flat-screen TV, DVD player and sound system for those cosy evenings in. 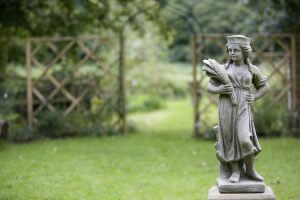 The cottage’s delightful private garden abuts the Midford Brook and is a veritable haven for wildlife. The outdoor dining area and additional terraced area near the edge of the riverbank, complete with BBQ, make for a great way to pass an afternoon. Fishermen’s Retreat is in a superb location for visiting attractions all over the south west such as Cheddar Gorge and Longleat. However, most guests find plenty to do on their doorstep; from canoeing to boating on the Canal, horseriding at Wellow, or visiting one of the many local National Trust properties, there’s lots of activity to jump into. 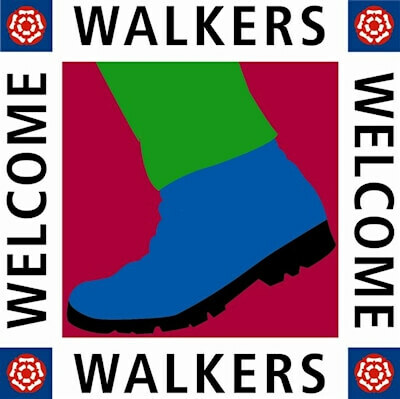 Walkers and cyclists will enjoy a whole host of countryside walks and cycle routes nearby, including the Sustrans 24 route through the Two Tunnels Greenway. 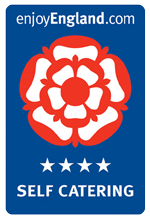 There are also two excellent independent gastro pubs serving quality food daily just 15 minutes’ walk from the cottage. And Visit Bath, Of Course! Don’t forget to take a trip to the UNESCO World Heritage City of Bath and explore the beautiful Georgian architecture, leading food & drink scene and some of the city’s finest attractions. While you’re in Bath, make use of the Bath Reward Card offer, included with every stay. The card gives you discounts off The Roman Baths, Fashion Museum, Jane Austen Centre and Thermae Spa. Adventurers might love the savings at Wookey Hole adventure park too. You can also enjoy special prices and deals across the city’s fine dining restaurants and cafes, as well as local tours like the infamous Bizarre Bath walk. Wood burning stove (with logs, kindling and matches provided)? Check! Decanter of sherry and complimentary sweeties? Check? Oodles of blankets and pillows and towels? Check! Beautifully maintained garden with babbling brook? Check! Tonnes of wildlife to be spotted? Check! Entirely light pollution-free back garden perfect for star gazing? Check! 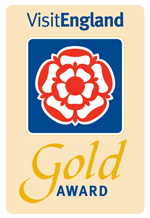 Fishermen’s Retreat has been granted the coveted 4-Star Gold Award from VisitEngland for exceptional quality. Thanks to fabulous reviews from our guests, the Retreat is also Rated Excellent on TripAdvisor and has consistently held a 9+ rating on Booking.com for over 3 years. In 2016, our family company won “Best UK Self-Catering Provider” in Luxury Travel Guide Awards. Book your stay and see why our guests love Fishermen’s Retreat, the ideal tranquil escape. 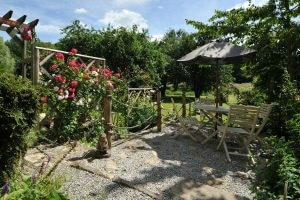 Part of the award-winning Tucking Mill Self-Catering portfolio. Entertainment: Digital flatscreen TV and DVD player, free Wifi, and iPod docking station. 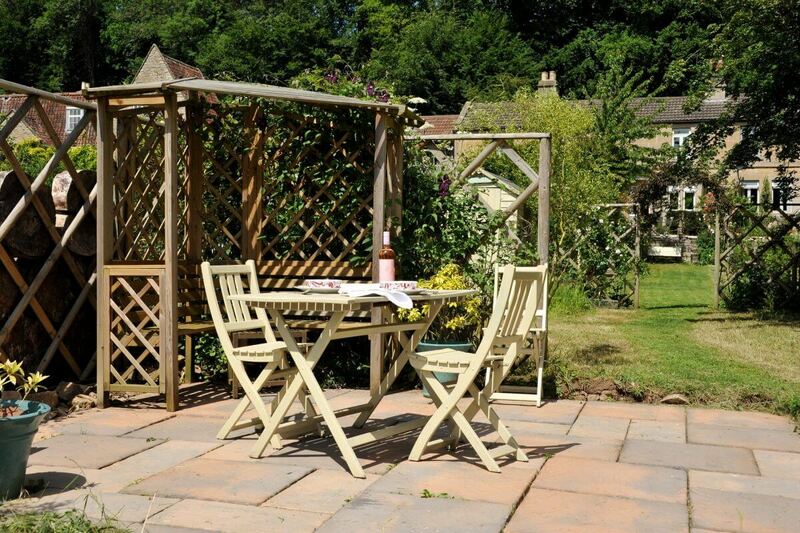 Outside: Private garden with two seating areas, one beside the cottage and one beside the brook; both have tables and parasols and chairs, BBQ also available. 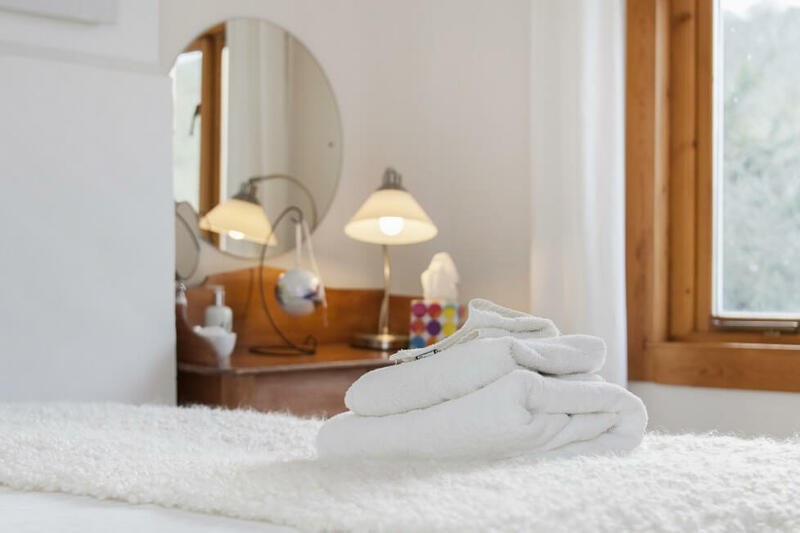 General Points: All utilities and tax included, Egyptian cotton linen and towels provided, and wood burning stove with logs. Washing up liquid, tea towels & loo rolls also provided. Parking: Availability for 2 cars. Free parking down a private drive. Airport: Bristol Airport is 22.6 miles (40 mns) away. Food Stores: Darling Deli, an 8-till-late Co-op and newsagents 1.4 miles away (5 minutes by car, 20 minutes on foot) at Summer Lane, Combe Down; Sainsbury superstore and Tesco Express 3 miles away on Frome Road (10 minutes by car). Bath City Centre, Midford Valley, Tucking Mill Reservoir, Tucking Mill Viaduct, Sustrans Route 24, Midford Brook, Midford Castle, Kennet and Avon Canal, Dundas Aqueduct, Monkton Combe Schools, Prior Park, Bath University, Bath Clinic and Circle Bath, MOD, Longleat, Stonehenge, Cheddar Gorge. Short Breaks: From: £100 per night. 10% off when you book direct. No hidden costs. If Tucking Mill View is unavailable, why not check our other award-winning cottage escapes Brooks’ View and Tucking Mill View?